As one of the leading scientists in silviculture and forest management in China, Professor Zhang Shougong, President of the Chinese Academy of Forestry, has long experience in establishment of planted forests and sustainable forest management. His research interests cover quality improvement and breeding of larch species, technologies for larch forest management and their application. 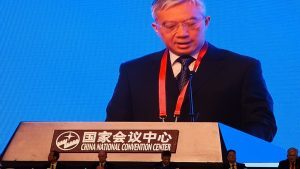 In his keynote speech he underlines the considerable growth of Chinese forests both in quantity and quality that has taken place over the past 30 years. Enormous efforts have been undertaken to establish new forests and conserve natural forests. Forest science is making crucial contributions to this development. Special progress has been made in the field of silviculture. Nine Experimental and Demonstration Sites for Sustainable Forest Management have been eatablished in different regions of the country, for example. In addition, 226 National Bases for Improved Materials of Forest Trees have been built all across China to collect and preserve core germplasm resources, among other things. Significant progress has also been made in the field of investigating forest structure and forest functions, such as the ecological restoration of degraded ecosystems by establishing forests. Furthermore, characteristic and new forest-related technologies have been addressed, such as mangrove conservation, bamboo forest cultivation, forest health monitoring, to name but a few. Also read the interview with Prof. Zhang Shougong at: http://www.iufro.org/events/congresses-regional.